Small - $114.99 Only 4 left! Large - $114.99 Only 3 left! X-Large - $114.99 Only 2 left! Are you ready for an awesome adventure through the Old West? Well, you certainly can’t go out in those city garbs ya have on now. No way. The Wild West is no place for city folk. If you’re serious about this adventure then you’ll need this amazing Wild West Cowgirl Costume! Toss on this adventurous attire and be ready for anything this Halloween. Will you be a heroic gunslinger or an infamous outlaw? Whether you want to be good or bad this year, you’ll be good to go with this costume! That’s the wonderful thing about the Wild West, nobody knows who the bad guy is until the shooting begins. So let that be a lesson to ya, your actions will speak louder than your words. You could be the good or you could be the bad, but you’ll never be the ugly, not with this cute cowgirl outfit. However as cute as you may look with this costume, you’ll still be more than ready to ride off on your next escapade. Some may underestimate you and that's fine, let them. Much to their surprise, it will be your six-shooter that will save their lives… or ends them. Yes, we are assuming that you are in fact an ace with a pistol and have a perfect shot. And under those assumptions, we have complete confidence in you being the next Best in the West! So, if you’re ready for your next adventure to begin, toss on this 3-piece outfit and the included accessories. 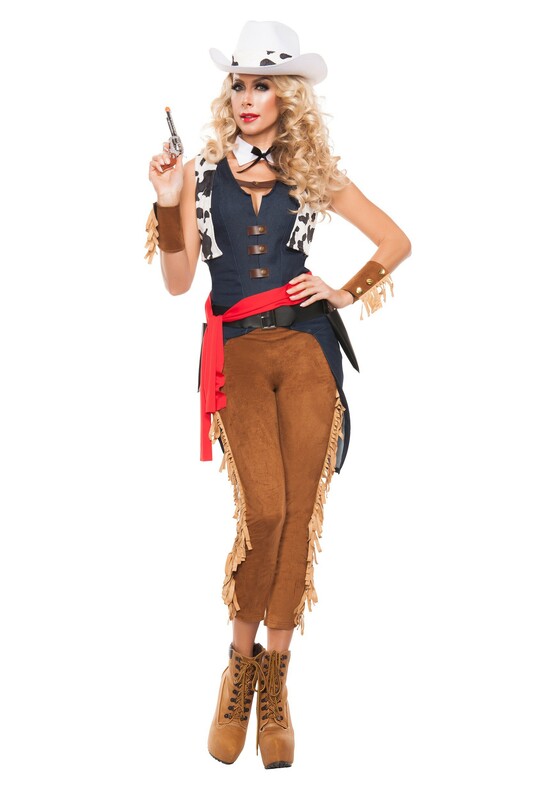 With this Cowgirl Costume you’ll give a whole new meaning to the Wild West!